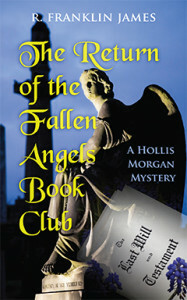 The series began with The Fallen Angels Book Club and continued with Sticks & Stones. “A wonderful thriller, loaded with twists and turns and red herrings that will leave you guessing all the while you are flipping pages to find out what happens next.” Read more…. Hollis Morgan is a survivor. She married young to flee an unloving family and ended up in prison, paying the price for her charming husband’s embezzlement. After finally obtaining a California judicial pardon, Hollis has climbed the ladder from paralegal to probate attorney at a respected law firm in the Bay Area. Unfortunately her first two cases are trials by fire. One involves a vicious family dispute over a disinheritance of family members who seem ready to stop at nothing to get their share. The other is the murder of her former parole officer, Jeffrey Wallace, whose will and family trust she is retained to file with the court. Too many people have motives and family mourners are few, so she resists processing the estate. Without Jeffrey, Hollis’ successful reentry into society would never have been possible. It was he who introduced her to the Fallen Angels—his other white-collar ex-parolees seeking a second chance. The book club they formed was a comfort and a distraction, until two murders forced them back under the scrutiny of the law. The group disbanded during the ensuing investigation. Now, realizing their debt to Jeffrey, they come together once more, determined to uncover the truth. Although Hollis has met a great guy—a police detective who knows about her past yet accepts her unconditionally—she is afraid to trust again. Naturally he doesn’t want to see her put her life in danger for the sake of a case, but he also knows she won’t stop until Jeffrey’s murderer is discovered. As both cases heat up, Hollis finds that probate law can bring out the worst in people and sometimes expose a killer. R. Franklin James grew up in the San Francisco East Bay Area and graduated from the University of California at Berkeley. She and her husband currently live in Northern California. Click here to find R. Franklin on the Web. The wind carried chilling fog across the Bay, making insidious snake-like pathways between the gravestones. Mourners wrapped in overcoats and scarves lined up on either side of the mound of dirt. Some dabbed at their eyes with tissues, others looked as if they wished they could be anywhere else but there. Everyone looked somber. Hollis and Rena stood closest to the casket at the far end of the gatherers. Richard, Miller, and Gene stood behind them. “Is there anyone who would like to speak before we proceed?” The minister kept shifting from foot to foot. It looked as if it was all he could do to keep his teeth from chattering. His cassock waved gently with the wind. Hollis looked around. There were about thirty of them gathered. Women outnumbered men, but not by much. She looked over at the family. Jeffrey Wallace’s wife, brother, and son stood apart from the others at the head of the gravesite. Their faces were stoic, unexpressive, as if they were still in shock. “Wait, I want to say something.” A large burly black man wearing a beige trench coat over a suit without a tie came forward. He looked to be in his forties, with a shaved head and heavy mustache. He wore thick glasses and carried what appeared to be the Bible. “Yes, please, go ahead.” The Minister backed away to let him come forward. This time a young woman came forward, shouldering her way briskly through the group, saying “excuse me” repeatedly as she made her way to the front. Hollis had noticed her at the beginning of the service. She was extremely tall with pale blue eyes and thin blond hair that she wore in a bright red clip on top of her head. Despite the cold, she only wore a brown sweater and a thin beige sheath. Her nose had turned bright red. She wasn’t pretty in the classic sense, but attractive in a quirky way. “Jeffrey Wallace was a good man. He wasn’t perfect. He sent me back to prison even after I told him I couldn’t pass the surprise urine test because I’d made one little slip the night before. But I didn’t blame him; he had to do his job. The thing is, he didn’t give up on me either. When I got out again he found me work, and now I really am clean. That’s it. Goodbye, Jeffrey.” She took a tissue out of her sleeve and dabbed at her nose. The minister, not wanting to preempt any further speakers, stood quietly. Hollis could sense more than see Richard shifting restlessly behind her. Rena had also started to rummage about in her purse for tissues. When no one else came forward, the minster checked his watch and looked to the widow for a sign. She gave a curt nod. “We should all bow our heads,” he intoned. A few minutes later the service was over, and a winding group of mourners passed by the casket. They trudged steadily to the family’s receiving line formed at the end of the path to introduce themselves and give condolences. Hollis tried to think of some inconspicuous way of getting out of the line without having to interact socially with a family she knew she would never see again. But she was gently herded forward by the people around her. She wondered if her expression looked as grim as those of the other Fallen Angels. A few steps behind Gene, she approached the mourning family. She couldn’t resist peering at the woman Jeffrey had married. According to the obituary, Jeffrey had been married to Frances for eight years. Even more of a surprise was that this was his second marriage. His first ended when his wife died in childbirth. Their son, Brian, had survived. She did a quick calculation; Brian must be in his mid-twenties. The line moved at a steady pace, putting her one person away from an older man standing next to Frances. It was a safe guess that he was Jeffrey’s brother. People were murmuring their sympathies, and the family of three stood with their backs together as if poised to ward off the furies. Hollis was now next in line. The man was short like Jeffrey, but the resemblance ended there. Jeffrey always reminded her of a friendly puffin. His brother looked like a hawk. “I’m Jeffrey’s brother, Calvin, thank you for coming.” He reached out his hand for a gentle shake. At the sound of a raised voice, Hollis looked ahead to see a young man grabbing Gene’s arm. “You’re Gene Donovan? I need to speak with you.” Brian, Jeffrey’s son, put an arm around Gene’s shoulder and pulled him aside. Brian was his father’s double—short, with brown hair and a solemn face. Hollis stopped behind Gene, who turned and gave her a questioning look. “Ah, ah sure … wh-when?” Gene stuttered uncharacteristically. Usually full of confidence, he must have been caught off guard. Hollis left Calvin and stood in front of Frances. She could see that Brian Wallace had not loosened his grip on Gene’s shoulder. But it was clear from her clenched jaw that Frances’ plan was to ignore the interchange. “I’m Frances, Jeffrey’s wife, thank you for coming.” Either she had repeated the phrase one too many times, or she was simply bored. She sounded like a robot. “You’re Hollis? I was hoping you’d come,” Brian said. Letting go of Gene’s shoulder, he reached across his stepmother with his hand outstretched for Hollis to shake. “Are all of you in the book club?” He pointed to the five of them now bunched together and halting the receiving line. Gene was going through his jacket pockets, searching for a card. Hollis looked past Frances to Rena, who was stopped in front of Calvin. Frances, who could no longer ignore her stepson’s conversation, was looking more irritated by the second. “Brian, please.” Frances’s raised voice was strained. “Sorry.” He spoke urgently to Hollis and Gene. “Call me and let’s talk. My father told me about you and I think I could use your help.” He gave his number. “Yes, of course we’ll call and set something up,” Hollis interjected, not wanting to be any more obvious than they already were. Gene let her lead him away from the line, and they headed down the grassy pathway, back to their cars. Gene got behind the wheel. Hollis sat in the back. “You tell me. I guess there’s a dysfunctional family out there for everyone.” Gene shook his head. Rena slid quickly into the car, followed just as hurriedly by Richard and Miller. “Now that was strange,” Richard said, taking a knit cap out of his jacket pocket and pulling it down to cover his bald head. “I don’t know, and I get the feeling Frances may not know what he has in mind either,” Hollis said, watching the mourners return to their cars. When Brian reached his car, he looked back at them. Frances must have pulled on his arm, for he immediately climbed into the limo waiting to take them away.